Click the Image Above to watch the E Chord Tutorial! A really common question here in the Underground is "How do I get my fingers to hold the E Chord?" 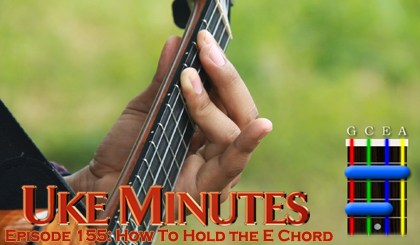 In this episode of Uke Minutes, Aldrine shows you a quick way to begin stretching your fingers to help them bend properly in order to hold the E Chord. He also breaks down the best way to position your fingers to create leverage to hold the E Chord cleanly. Click the link above to check out the tutorial and be sure to Sign In to your UU+ account (or Sign Up for a UU+ account if you need one) to see the Bonus E Chord exercises to help you on your way to E Chord greatness. Rock on & keep strummin'!